Mark One Apparel managing director Mark Halabe is proud to own his dream car, an innovative full electric BMW car, one of the first in Fiji. A leading figure in our garment industry, Mr Halabe said he bought his ‘pure electric car’ last year from Australia. 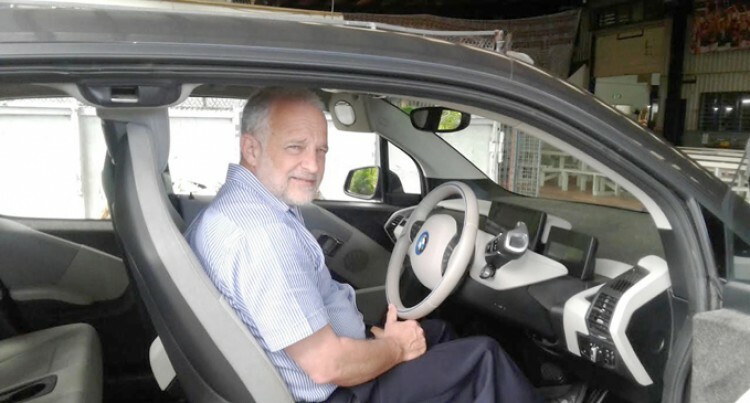 His electric car, BMW i3 Model 1Z42 2015 is part of first fully developed range of BMW electric cars. Mr Halabe said it’s created with carbon fibre and all features in the car are made from recyclables. “Two years ago, I was in Munich, Germany before I bought this car,” he said. “I was in a BMW museum which had all the models. Mr Halebe said a couple of years ago he chaired a Government committee for greening Fiji and the industry. In that process, he recognised that the fossil fuel car is really detrimental to the environment. “I read about this car and thought this would be a good statement to make,” he added.